Tensions in Egypt's North Sinai reached new heights in the early hours of Wednesday as Egyptian security forces engaged in battles with militants in several areas of the governorate shortly after assailants opened fire on three joint military-police checkpoints. Many checkpoints, especially in the city of Arish, saw exchanges of fire. Egyptian security troops and helicopters were reported to be combing the eastern area of El-Halal Mountain, hunting for armed insurgents. According to eyewitnesses quoted by Al-Ahram's Arabic-language news website, many of the gunmen were killed or injured in the raids. Several Egyptian security were reportedly injured too. No accurate death or injury tolls have yet been released. Eyewitnesses also said that Egyptian military jets pounded several spots in the town of Sheikh Zuweid while chasing suspects. The attacks of three joint military-police checkpoints late on Tuesday night came two days after 16 border guards were killed by as-yet unidentified assailants in an incident that laid bare security problems on the Sinai Peninsula. 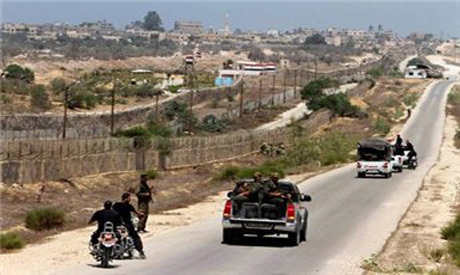 A resident from Al-Arish city was injured in the crossfire as gunmen attacked Al-Risa checkpoint. The two other checkpoints were on the main road between Al-Arish and Rafah, the city that was at the centre of Sunday's deadly attacks. No deaths were reported from the checkpoint attacks. Exchanges of fire lasted until the early hours of Wednesday before armoured vehicles were sent in an attempt to contain the situation, eyewitnesses told Al-Ahram's news website. It was the 29th attack on Al-Risa checkpoint since Egypt's 2011 uprising. The northern parts of Sinai have sunk into a state of lawlessness since last year's 18-day uprising that overthrew former president Hosni Mubarak. But the situation took a severe turn for the worse on Sunday with the attack on Egyptian troops at the border with the Gaza Strip, governed by the Islamist group Hamas. Political figures – Egyptian, Palestinian and Israeli – have traded accusations over the causes and perpetrators of the terror attack. No one has yet claimed responsibility. The Muslim Brotherhood, from which Egypt President Mohamed Morsi hails, accused Israel's intelligence agency Mossad of carrying out the attack to "hinder Egypt’s progress." Hamas and Israel have both distanced themselves from the attack, which the latter's defence minister Ehud Barak said hoped would serve as a "wake-up call" to Egypt, which has been struggling to assert control over the Sinai peninsula. Morsi declared three days of mourning for the slain border guards. A military funeral was held on Tuesday. Those who blame Israel because of this are nothing but being ideologically irrational and senseless. This is the work of Palestinian and Arab foreign Salafist jihadist that are against not only Israel, but also against Egypt, its armed forces, and to a lesser extant, the Muslim Brotherhood governments under Morsi and Hamas in the Gaza Strip. We cannot let the Sinai peninsula becoming another Yemen. Please let DIALOGUE be put in place for God sake and LIFE sake. Stop the slow genocide of the Palestinians since 65 YEARS! Start by asking Israel to Diologue instead of Legalizing, arming, encouraging and protecting mad extreemist religious Settlers, who attack defensless Palestinian villages, demolishing their homes, confiscating their land, shooting unarmed Palestinians, imprisoning childrens, keeping them in solitary confinement without school nor parents, without minimum Human Rights, just World Silence!!! Good for Egypt and good for world peace! It's a tragic event, but I applaud the Egyptian military SCAF and police for going after those terrorists in northeast Sinai who want to turn the clock back on Egypt. Egyptians will not let their great civilization fall victim in the hands of those extremist thugs. I wish Egyptians were as intelligent and level-headed as you believe. However, I think far too many are so mislead and poorly informed by an incompetent state-run media, and by their religious leaders, that I suspect Egypt is being sucked into a whirlpool like vortex of ever worsening chaos. Morsi is not to blame for this descent, but unless he can rise to a greatness of statesmanship, he will be held accountable by history for being too weak.